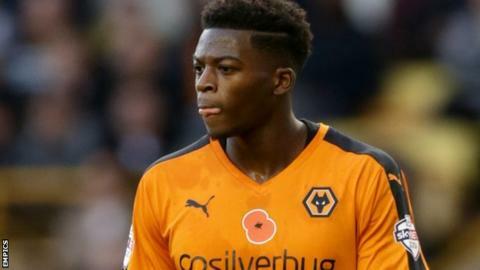 Wolves' England Under-21 international defender Dominic Iorfa has signed a new three-and-a-half-year deal with the Championship club. The full-back, 20, had 18 months left on his existing deal but has now extended his stay at Molineux until at least the summer of 2019. "It's been going on for a while now and it's a good feeling now it's all been sorted," Iorfa told the club's website. "I'm staying grounded, I still want to do well and keep improving." A graduate of the Wolves academy, Iorfa made his professional debut while on loan at Shrewsbury Town in March 2014. He started his first Wolves game that December and made 22 appearances last season as Wolves finished just shy of the play-off places on goal difference. Iorfa has remained a key member of Kenny Jackett's side this term, missing only two games. "The last 12 months have gone really well for me," added Iorfa. "From where I was at this time 12 months ago, to where I am now with the amount of games I've played for Wolves and being in the England set up. "I'm just really happy and I'm looking to kick on from here."